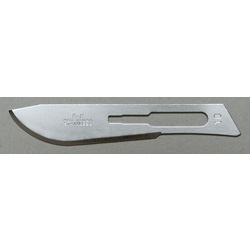 Offers the superior cutting advantages of carbon steel technology, including consistent sharpness, control, and strength. Packaged for safety and ease of use. Sterile. Sold 50 per box. Size 11 scalpel blade. Carbon steel rib-back. Size 11 scalpel blade. Stainless steel. Size 15 scalpel blade. Carbon steel rib-back.